Paper Crafts by Candace: Breakfast Blog Hop! Hi there! Welcome to the National Breakfast Week Blog Hop! Now don't let the name fool you, this hop is for TODAY ONLY, not a full week! Our blog hop is sponsored by Jaded Blossom and SVG Cutting Files, so sit back, relax and enjoy the wonderful creations the teams have made using some of the most beloved Cereal Icons of all time! Now if you came here from Michelle's Blog then you are in the right spot. If not, you will want to start at the beginning with Annie. And now for my project! My icon is Sonny from Cocoa Puffs! 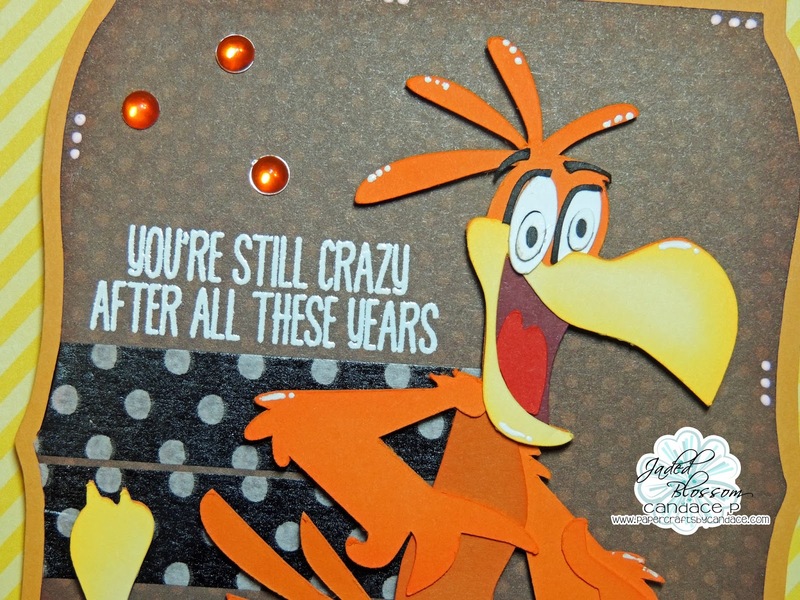 The sentiment is from Jaded Blossom's "Another Year Older" and is embossed in Stampin Up white embossing powder. Free SVG Files from the stops on this blog! Yes, you can earn all of the files you saw today by simply completing the following requirements! To request your files, you MUST complete the blog hop, and read the posts. One of the blog posts will redirect you on how and where to submit to get the free files. **YOU MAY ONLY SUBMIT your request ONE TIME. Your IP will be BLOCKED after you enter, so PLEASE MAKE SURE YOU follow the requirements above in order to qualify to get the FREE SVG files. You will NOT be able to go back in and alter your form request. Free File Request ENDS PROMPTLY at 11:59 PST TONIGHT, March 5, 2014. Any forms submitted after this time will not be eligible for the files. Next up on the Line Up is the amazing Jamie! The saying fits the character perfectly. Thanks for sharing! Great card! Love all the sentiments being used! Great hop! Cute! I need a birthday card for Friday, and Sonny will fit the birthday boy (age 60) perfectly! Love the card and the saying! I can already think of a few friends that this card would be perfect for! Love the sentiment! Great job! I was definitely Coocoo for Cocoa Puffs! LOL! Adorable! coo coo for cocoa puffs!!! gotta love it!!! Toooo funny!!! LOVE COCOA PUFFS!!! Great job Chica!! Wow what a great idea! Love it! Made my day! I'm always amazed at the creative projects you all make, as well as the quality of the SVG files! Thank you so much for sharing your amazing talent!! Great job. These are bringing back great childhood memories. So much fun and so creative! Aha! I say this all the time " coo coo for cocoa puffs!" great job. Always loved this saying and the commercials for it. Thanks! The cereal character is perfect. Loved his commercials growing up. Love love love these!! Super cute! LOL! I love the sentiment you used! It is so PERFECT for the die cut! Another great project! Thanks for sharing! Wonderful card! I love the sentiment you used. Love it! What a perfect sentiment for sonny! This one was my favorite...CoCo Puffs, did a great job...thanks for sharing..
Love the shading and all the little details! Great card, love the details. Awesome! 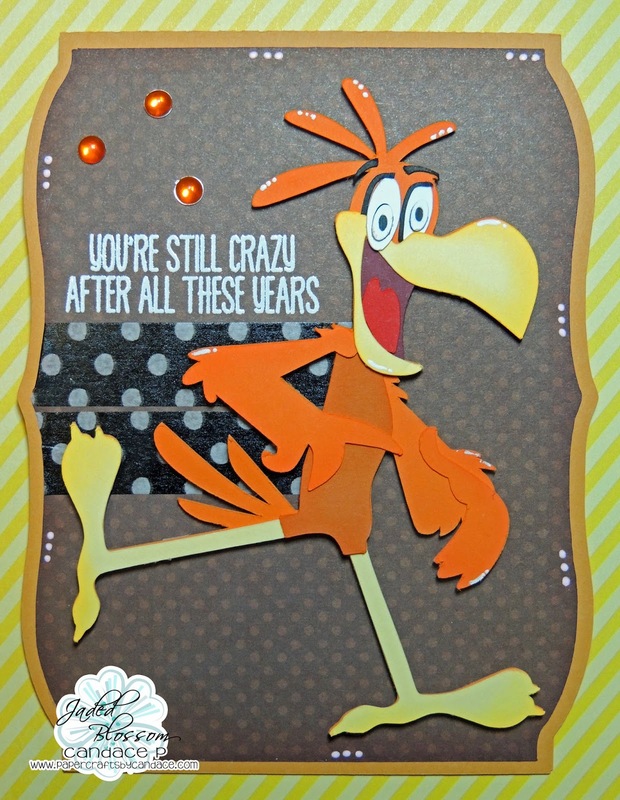 Love the crazy bird! I love it!! So cute! Thanks for sharing your creation! I am Cuckoo for Cocoa Puffs. Ok you guys are hitting all my favorite cereals as a kid! Great job on your project! I still remember the commercials for Cocoa Puffs! So cute! Great details and shading! Love your sentiment! What a fun hop!! Everything you guys do is so versatile!! My son's favorite cereal and I still remember those commercials from when I was a kid! Great job! Love how Sonny turned out. I've Got to make this one for my mom...lol...she'll love it. cuckoo for cocoa puffs! Cute! My kids favorite cereal - thanks! Crazy about Coco Puffs!! Very cute! Very cute and clever way to use the cut! I have never tried cocoa puffs, but his fellow is cute! Cute card and love my cocoa puffs. Sonny is amazing. What a cute card. I love that crazy bird! I was always Coocoo for Coco Puffs! Great card! Oh goodness, what a super cute card! And the sentiment is perfect!! Love it! Looks like me before my coffee!lol Super cute! I am loving this hop!!! Great job!! Love this card. One to make for the kids. Lol! Sonny looks so cuckoo for cocoa puffs! Love how the JB sentiment fits him exactly! I'm COOCOO for this lol love it! this is my first blog hop! i'm very excited! Thank you for sharing your talent! Crazy for Cocoa Puffs... lol awesome card!!! love his crazy looking eyes too! perfect!!! These free files are always great. So true to the characters. What a great card, and the sentiment is perfect!!! Love the addition of the white dots, Sonny is so cute! COO COO for this file! Thanks. These are really great! he is too cute!!!! great job! Oh Cocoa Puffs. Love this crazy character. I used to love cocoa puffs! What's so funny, is that I remember seeing this character all of my life, but I never knew his name was Sonny!! Ha-ha! Thanks for enlightening me! Great job! And I love that sentiment!! Hilarious!! Thanks for sharing! Really cute idea for a card! Good job...I have some cuckoo friends who will like this. I'm cuckoo for cocoa puffs, too! This would be a perfect card for my older brother! Thanks for the idea! Love it!! Still crazy about cereal! Cuckoo for coco-puffs! Thank you! coo coo for cocoa puffs! best line in cereal. I remember the one and only time we were allowed to eat them. and I've never had them since. this is my girls favorite, very cute!!!! I remembered Coco Puffs, but had completely forgotten about Sonny. How could I have forgotten this adorable guy I don't know! Love him. Thanks for the hop and freebies. This hop is making me happy!!! Sonny is adorable - as is you card!! So much fun - and what a PERFECT sentiment to go with it too! This totally cracks me up!! I LOVE it:) TFS! LOL!! He is awesome!!! Love the Washi Tape!!! Crazy for Coco Puffs!!! Woohoo!!! You did fantastic with this sonny!!!! coo coo for cocoa puffs!! Thanks for sharing. Love your idea for Sonny. Love it and fantastic hop!!! Love his expression! Love the card too! I have many friends that would love this card!! Love this sentiment! Thank you for such a cute design! Haha, love that crazy bird. I am "COOCOO" for this card.. great job Candace. Thanks for sharing. Your card is so cool! Love the sentiment you chose for your card, perfect for the image:) Thanks for sharing and for the inspiration! Cocoa Puffs are my husband's favorite! Very cool card. My all time favorite cereal. So excited. Thank you. Very cute card, i hope to learn how to use svg files at the next expo so i can make this. Thank you for sharing. What a perfect sentiment for this image. Great card! Nice card. Fun. Very appropriate sentiment! Hope you are having fun too! Awesome card! The sentiment goes great with it! The sentiment stamp was MADE for this file. So perfect. Love your card Candace!! He is awesome! !